Simon Jeffes' untimely death left a gaping hole in the high specialized world of joyful fringe music. His son Arthur picks up the pieces by re-releasing his father's final studio album on vinyl and pays tribute to it through live performances. Back in the early 1970s in the south of France, British musician Simon Jeffes ate some bad fish and succumbed to food poisoning. He experienced a state of delirium that went on to alter the course of his life and career. In these hallucinations, he saw a dystopian future where people went about their daily activities while being emotionally disengaged from them. The authorities spied on people as they engaged in soulless love making and music listening. Somewhere down the road from this miserable abode was a boisterous cafe where the lights were always on, the music was always swinging, and food and drinks were served by penguins. This penguin cafe served as a refuge from everything that was wrong in Jeffes's fever dream. When his illness broke, Simon Jeffes decided he was going to go about bringing the sound of the music from the proverbial penguin cafe to all the world. And when it came to carrying the idea from theory to execution, nothing was off the metaphorical musical table. Jazz, neo-classical chamber, minimalism, English folk, and a touch old rock modes are just some of the things you are treated to when listening to the Penguin Cafe Orchestra. But it certainly didn't end there. For "Telephone and Rubber Band", Jeffes looped the sound of two overlapping telephone tones and plucked a rubber band wrapped around a wooden chair while his string section sawed out the melody. And just to prove that his song titles can be nothing if not truthful, "Music for a Found Harmonium" was composed on a discarded instrument that Jeffes found sitting on top of a pile of garbage in Japan. The ripple effect from the Penguin Cafe Orchestra continued to stretch. Simon Jeffes rearranged some of his best-loved works for the David Bentley ballet Still Life at the Penguin Cafe (eventually recorded by the BBC Orchestra). NPR's All Things Considered grew fond of using "Prelude and Yodel" as an interlude between stories. "Music for a Found Harmonium" has found its way into several feature films, including Napoleon Dynamite. Even as his profile was on the rise, Simon Jeffes's music always managed to be good-natured, exciting, accessible, and just a little bit challenging. As Brian Eno put it, "He had no trace of musical snobbery, but delighted in the length and breadth of music, happy to experiment with all combinations." By the early '90s, Jeffes and company attempted to strike out on their own by creating the record label Zopf. They released one more studio album named Union Cafe before the Penguin Cafe Orchestra's leader's untimely death in 1997. Union Cafe was a brilliant album released during the heyday of compact discs, and thus never saw a vinyl release. With 16 songs piling in at 73 minutes, it was like a salty classical outfit's take on the London Calling format where musical styles and the corresponding qualities are overflowing onto each track. You have the minimalist dedication to composer John Cage in "Cage Dead", the simple yet effective melody that drives the light touches of "Nothing Really Blue", the freewheeling and raucous "Scherzo and Trio", and unapologetic romance behind "Silver Star of Bologna" and "Vega". Alas, the music scene in 1993 wasn't too sharply focused on the likes of the Penguin Cafe Orchestra, securing Union Cafe's reputation as that of an overlooked nugget. Arthur Jeffes, the late composer's son, has decided to rectify this. In conjunction with Robert Raths of Erased Tapes, the junior Jeffes has re-released Union Cafe in all available formats, including its first pressing on vinyl. And in an attempt to further the reputation that the album deserves, Arthur Jeffes's band Penguin Cafe will be performing the album live from front to back. Penguin Cafe, not to be confused with Penguin Cafe Orchestra, was formed roughly ten years ago when Arthur Jeffes decided that he wanted to pick up where his father left off. Their latest album, The Imperfect Sea, was released earlier in 2017, but that doesn't mean that Jeffes and company are due for a break. We caught up with Arthur one evening as he discussed his father's role in creating Union Cafe, his new band's role in interpreting it for the stage, and his future with Robert Raths's company. Why did you pick Union Cafe as the album to re-release to commemorate the 20th anniversary of your father's passing? For me, it's the least exposed album by my dad. He left the model of having a big label [E.G.] and decided to start his own label (Zopf). It took ages to promote. It's a funny thing; it almost fell through the cracks due to timing or something. It's that slightly unknowable thing, the landscape for albums when they happen. There's also the fact that it ended up on CD and never on vinyl, showing you that it was a slightly odd time. It wasn't wrong; it was just something that didn't happen the first time around. There's "Vega", a 10-minute long piano and strings piece -- for me, that's my dad being amazing. It's always washed over me, and now we're actually playing it. I'm not sure if it's possible to find an undiscovered album by my dad, but this is relatively under-known I'd say - so it just made sense to do it. It would have been great to do a re-release of all the vinyl - which I still want to do - but the times being what they are, I think this is the most beautiful and economic thing to do. Do you have any memories of this music being composed? I remember "Nothing Really Blue". The beautiful thing about my dad's way of composing are the mechanics of the playing that lead you into the execution. As soon as you get the shape of what's happening physically, that's how you get into the music. So, "Nothing Really Blue", I was there for it. I saw it. Right now we're just working out "Yodel 3" on guitar, and it's like a little time machine. It's gentle and beautiful, it's been a moving experience. I was probably 14 or 15, so I was aware of them. At the same time, I was probably annoying and teenaged. Have you grown to appreciate certain pieces more over time than when you heard them as a teenager? It's funny. "Silver Star of Bologna", I was with my dad in Bologna when he was working on that. And I didn't realize how hard it is to play! I used to assume that it was one trick involving crossing your thumbs over. Now, when it comes to actually learning it...you see, I think he maybe regarded himself slightly more as a guitarist rather than a pianist, while I'm more of a pianist. I have to say, it gets really tricky! But it's really fun! It transcends the decades. I think "Vega" and "Silver Star of Bologna" have become my two new favorite Penguin tracks. 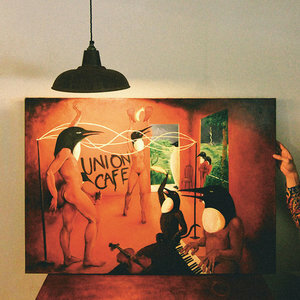 Your band, Penguin Cafe, is going to be performing the entire Union Cafe album live. Has getting the rest of the band to go along with it presented you with any unique challenges? They're really good. Some of them are from a jazz background, some from a classical background. My musical director, Vince Green, he plays viola, he transcribes all the parts where we can work things out if we need to. But that doesn't quite cover it because the physicality of the music isn't quite transcribable. What's been happening a lot is that I would go "Oh, this isn't how I would do it." And then I realize "Of course that's how we'll do it." It's nice to find solutions to problems that were solved with the original compositions. According to your Wikipedia page, you took a hammer to some piano keys when you were younger. Yeah! The same piano where my dad wrote "Nothing Really Blue" at, it was actually my mum's piano. I think she inherited it from some family, a lovely upright. But I wanted it to be louder. We still have it. The front of all the keys has been smashed off. It was me just trying to get a wider dynamic range I guess. It's a little dangerous to play now because you can cut your fingers on the pointy bits. This search for a wider dynamic range, is this something you've carried with you ever since? It is, it is. Although now I'm at the lower end. The softer a piano can get, the better the options. On this last album [The Imperfect Sea] there's prepared piano on "Rescue" and "Wheels Within Wheels", among others. I think there's an incredibly fertile seam there. Speaking of prepared piano, isn't there a piece on Union Cafe paying tribute to John Cage? [Laughs] Yeah. It's C-A-G-E, then D-E-A-D. You then play those in various, different ways. We're sorting it out at the moment. My dad also stepped in as composer to make it sound beautiful. It's a huge development, eventually done very slowly. There was a lot going on in there because they recorded it at Real World Studios, and a lot of sounds on there come from whoever happened to be coming through that day. There's a lot of forensic musicology going on when trying to reproduce it. Your father retold his food-poisoning story many, many times. Did he ever get tired of telling that story? Or did it amuse him so much that it never got old? [Laughs] That's a good question. I think it would change in every telling. My dad was a Zen Buddhist, and he was interested in meditation and the arts. He kind of believed that the truth stayed the same even though the facts may change, I think. I'm pretty sure that the story behind the harmonium, for "Music for a Found Harmonium", has a certain variability. Beauty and truth are kind of inter-changeable while the meaning is pretty much the same. I don't think he got bored, I think he enjoyed the way it evolved. I read that you were an Arctic explorer. Yeah, that was more by accident than by design. My Great Grandfather was married to Kathleen Scott (widow of Scott of the Antarctic) after Scott didn't come back from the Antarctic - so there was a family connection of a sort. We were recreating Scott's expedition with all the original kit for a television program to mark 100 years since it all had happened. Any parallels between that and your musical life? I was there for three months, mostly dragging a sledge. It was very exciting and at the same time extremely boring. Lots of endless white expanses. It was there that I decided that I wanted to go and do a masters in music when we got home. It was a great experience, but I'm not a big outdoorsy person [laughs]. There's a program on BBC2 where, if you watch it, it'll be quite clear that I'm not really into the Antarctic. Does your band have any concrete plans beyond the performance of Union Cafe?